David Tait, a respected member of the community, with a kindly manner and gentle humour, has died at the age of 86. A retired teacher of English as a foreign language, he was involved in a range of organisations and activities in Shoreham. David passed away peacefully on February 25 and his funeral was held yesterday. He was chairman of the Shoreham Society in the early 1990s and for 40 years, he and his wife Elizabeth were readers for Talking News, as well as giving hour-long illustrated presentations about poets and aspects of Sussex. David and Elizabeth recorded news and short articles, providing weekly audio news for the sight impaired, at first in Brighton and then, when they moved to Shoreham, for Adur Talking News. David led a team of four readers, once a month, for the 90-minute recordings, until Adur Talking News was disbanded in 2016. Playwright Trevor Harvey, a friend and neighbour, said: “He had an excellent reading voice and, like his wife Elizabeth, he was able to use it to create different characters. David and Elizabeth also put together a number of hour-long talks, illustrated with numerous slides, and performed with much success at various clubs, societies and WI groups throughout Sussex for more than 20 years. David was vice-chairman of the Shoreham Society, then became chairman 1991, a position he held for several years. At the time, the society was responsible for the day-to-day running of the Marlipins Museum, in Shoreham High Street, so David became closely involved. For several years, David was also a leading member of the Probus Club. 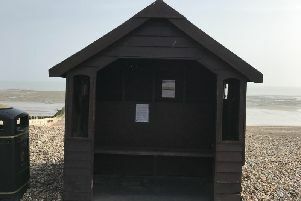 In 1998, David wrote the script for Bungalow Town Memories, an entertainment he and Elizabeth presented with readings, sketches and songs about the early days of Shoreham Beach, with its music hall and film star residents. Performed to a packed house at Kingston Barn as part of the Adur Festival, it included an interview with the niece of Marie Lloyd and songs from the 1900s to 1940s sung by close harmony group The Worthingaires.